Offering great natural light and views to the outdoors, large glass expanses such as window walls and sliding glass doors deserve window treatments that enhance their benefits. That’s why Hunter Douglas makes vertical blinds that are as beautiful as they are functional—they come in countless colors, materials, and textures and offer room-darkening options as well as protection from UV rays and privacy. To see the full line of options available, speak with a trained professional at Window Treats serving Middletown today. 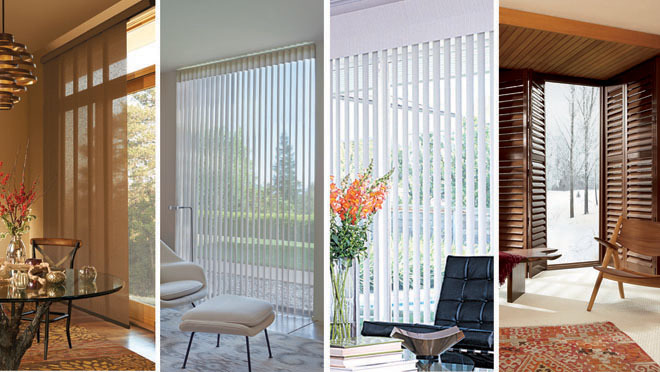 Vertical blinds are a beautiful part of the décor within your home, adding an area of beauty and interest to a room. You’ll not only enjoy the privacy they provide, but you will realize energy savings, as they prevent the sun from entering the room in summer or heat loss in the winter. The Hunter Douglas vertical blind collection includes Cadence® Soft Vertical Blinds, which feature two soft S-shaped louver styles; Somner® Custom Vertical Blinds, which include fabric, vinyl, and aluminum choices to complement any décor, from traditional to contemporary; Vertical Solutions® Vertical Blinds, which is a smaller, more basic collection that is affordably priced and features both fabric and vinyl vane options; and Skyline® Gliding Window Panel Blinds, which are a unique style of vertical window coverings that can cover large windows up to 23 feet and come in two panel sizes: 17½” and 17″.